Whitacre Greer’s dry pressed, bevel-edge pavers are an innovative product developed from more than 40 years of press-forming experience. Use the following Whitacre Greer clay paver specifications and details when choosing these products for your project. These popular pavers offer permanent rich colors that will not fade, superior freeze-thaw resistance, minimal chipping and exceptional dimensional stability. The entire line of pavers is available with side lugs for automatic spacing in laying applications. Straight edge pavers are also available in all thicknesses. Whitacre Greer dry-pressed pavers are available in a variety of shapes and sizes, from 1-1/2″ to 3-1/2″ thick for paving roadway’s, patios and driveways, with special sizes for garden projects.Traditional and unique sizes encourage design flexibility and greatly increase the number of potential installation patterns. Landscape Architects, Architects, Engineers and Design Professionals – use the information below to craft your specification for Whitacre Greer pavers. Provided specifications and installation details are guidelines developed from the Brick Industry Association and industy best practices. Consult a segmental paver specialist for details applicable to your project. Installer qualifications: three years experience with at least 75-100,000 square feet installed. Successful completion of five similar brick paver installations similar in design which are to be documented. Installer has included the specified product(s) in their bid and they have read and understand the contents of ASTM C 902 and/or C 1272 as applicable. Mock ups must be done showing the quality of work expected. Work shall not start until the mock up is approved by the architect. Pre-installation meetings are recommended. Include paver distributor or manufacturer’s representative. 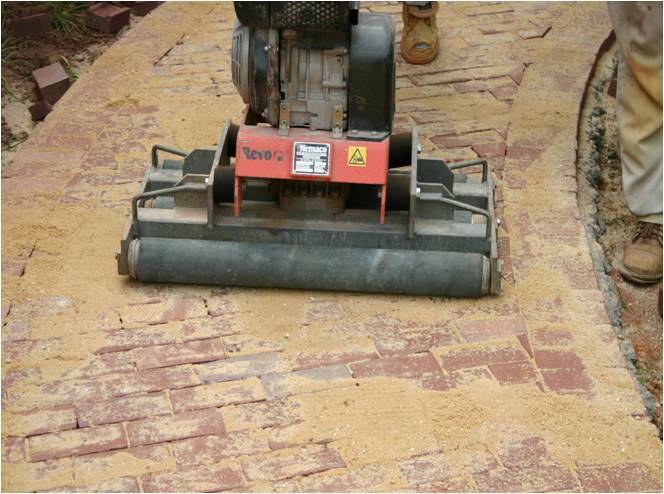 Provide 1/16″ – 3/16″ sand filled joints between pavers. Surface flatness not to exceed +/- 3/8″ over 10 feet. Lippage not to exceed 1/8″ between adjacent pavers. No work is to be done when any materials are wet or frozen. Installer must blend from a minimum of three pallets of brick pavers. Bituminous set pavers can and should be rolled or compacted to achieve full bond with the setting bed, reduce lippage and improve the overall flatness of the surface. See Brick Industry Association Technical Note 14B (pg. 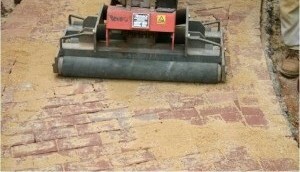 11) and Flexible Vehicular Brick Paving Guide (pg. 36). Protect pavers by using a rubber roller or a 4-5000 LBF plate tamper with a protective mat attached. 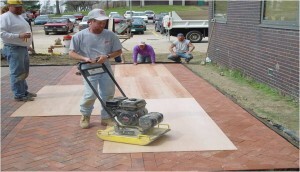 Plywood may also be utilized and is preferred to sand which may damage the surface of the pavers. Whitacre Greer dry-pressed pavers conform to the applicable standard specifications for such materials adopted by the American Society for Testing and Materials C-902 and/or C-1272, Class SX, Type I, Application PS. Application PX available on request. Colors and size within a given shipment may vary slightly due to subtle changes in clay composition and kiln firing temperatures. Pavers are sealed with a siloxane-based penetrating sealer/water proofer. All materials should inspected upon delivery. Please contact your Whitacre Greer sales representative for assistance applying these clay paver specifications and details to your project.